Eat Your City: Lemon butter garlic shrimp and mussels with asparagus on linguine recipe - hard to go wrong with butter, garlic, white wine, citrus and seafood for potluck! 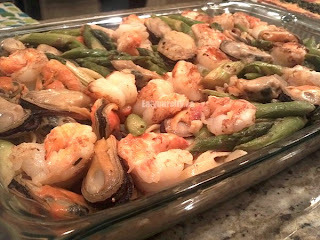 Lemon butter garlic shrimp and mussels with asparagus on linguine recipe - hard to go wrong with butter, garlic, white wine, citrus and seafood for potluck! I tossed this together in under an hour after I got home from work, so didn't get a chance to snap "as I went along" pictures. Sorry! Prep work the night before: Washed and trimmed the asparagus and tossed it back in the fridge. The shrimp I tossed into the fridge with a container underneath to defrost overnight - simply had to de-shell and de-sandtrack (take out the black guts) them when I got home.. then assembled everything together! Next time, I'll hold off on putting a lid on my pyrex pan (from my set of Pyrex Easy Grab 19-Piece Glass Bakeware Set) till the last minute before I leave the house - the heat and steam from the food made my asparagus overcook a bit... tinge of yellow-green instead of the deep green crisp color the asparagus was prior to the lid! 1. Cook the pasta in salted boiling water as instructed on the box to al dente (usually 10-12min), drain and set aside. 2. While the pasta is cooking, De-sandtrack, De-head, De-shell, rinse and pat dry with clean paper towels the shrimp. 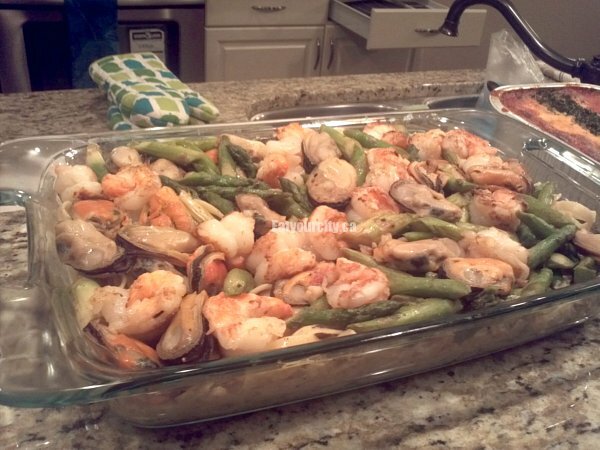 Marinate shrimp with 1 tablespoon white wine. Pull mussels out of freezer, or de-shell, de-beard and wash fresh mussels - set aside in separate bowl. 3. In a large non-stick frying pan on high, heat up 1 teaspoon olive oil, add in asparagus and toss to coat all asparagus evenly. Add in 1/4 cup water and cover. Cook until all water and steam is gone, uncover and toss until the asparagus is nicely caramelized and softened ~5-6min total cooking time. You can alternatively grill whole asparagus on a lightly oiled grill on low heat x6-10min until carmelized and softened. Then cut up into bite sized pieces, and set aside. 4. In same frying pan, add 2 tablespoons olive oil and 1 tablespoon butter and all garlic. After 30 seconds, spoon out garlic and reserve (otherwise garlic will burn). Add in shrimp, sear until one side is pink, flip and sear other side, cooking until the shrimp no longer has traces of grey. Transfer to clean bowel and set aside. 5. In same frying pan turn down heat to med-high and deglaze pan with white wine and broth, and add in mussels and reserved fried garlic. Cook for 6-7 min until mussels are cooked through and hot. Scoop out mussels into bowl holding shrimp. 6. Add in lemon juice and granulated garlic to the cooking juices in the pan. Reduce the sauce by 1/3. Then, slip in chunks of butter from the 1/8 cup of butter until sauce tightens up and emulsifies. (You may not have to use all the butter). Add in chopped basil. Salt and pepper to taste. 7. Add in reserved pasta and mix well, letting the pasta absorb the sauce until all the pasta is evenly coated and sauce almost all absorbed. 8. Dump pasta into a serving dish, add grilled asparagus, mussels and shrimp on top. Garnish with additional basil leaves if desired. Enjoy! !